Note: Free support is provided only for bugs, theme related issues Everything else, including the adding of complex features or css changes, will be treated as custom work. Note: Installation is also provided on Addiotional Cost. Note: Payment Confirmation may take 1 Day Due to Availability. Global Listening Pro is a Next Level Osclass theme with plenty of features and Responsive Design. Global Listening Pro Gives you features like Default Location, Auto Detect Location and language, Mailchimp and many more. Global Listening Pro Gives your Osclass a fresh new and Effective look. 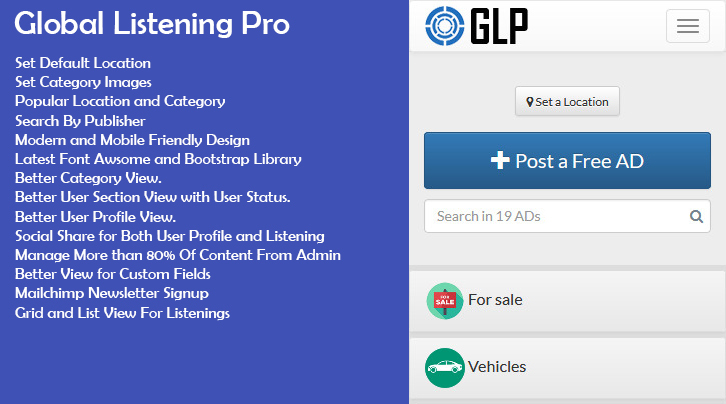 Global Listening Pro Premium theme for osclass classified script with advanced features and highly customizable from theme dashboard settings to make unique classified website. using the latest build of the Bootstrap framework! This theme has many Features you can check below. Once user choose Default Location then all the Ads will be displayed from the choosen Location on the Search Page and on the Home Page, even on Post Ad Page User don't need to Select Location, It will be auto selected! This Feature comes with auto location detect, first time when user visit, location will be detected and chossen automatically. auto location detect requires https protocol with valid ssl certificate. This Feature is Optional and can be disabled from admin. Global Listening Pro Osclass Theme automatically detect user's Browser Language and set the default Language. User can switch back to other language if they want. This Feature is Optional and can be disabled from admin. This Theme Support RTL Version and This Option can be Enabled or Disabled from Admin. This also come with another Feature that theme Enables the RTL Option automatically when User Choose Arabic Language. Global Listening Pro Osclass Theme comes with Mailchimp Subscribtion form. you just Need to update list ID and Api key from Admin. Mailchimp helps in Send Messages out to your Customers with an Effective eCampaign. Theme has 3 options to show category select control on Item Form. any Option can be enabled from Theme Admin. This theme has Better view of User Panel and also has a Section to show User Status. User Status Section tells about total posted ads, comments, user type, last login, register date and last updated. Global Listening Pro Osclass Theme has a Powerful Theme Admin to Manage Various Theme Features. Theme Admin has better UI that makes more easy to handle Theme Options. GLP Theme Supports Three Level Category for Item Form, Search, Details and On Other Area. 3 Level Category works with all available category style options. Global Listening Pro Osclass Theme comes with additional feature of ADs Posting Limits, You can set the Limit on AD Posting by Individual User, Company and Email. You can also set the Rules and Increase the limits by Email. Third Party Ads Supported even between the Ads List. Search by Publisher / User Option on Search Page. Note : Free support is provided only for bugs, theme related issues Everything else, including the adding of complex features or css changes, will be treated as custom work.